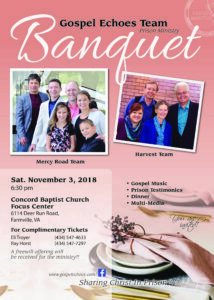 The Gospel Echoes Annual Farmville Banquet will be Saturday, November 3, 2018, 6:30 PM. Call Eli Troyer 434-547-4633, or Ray Horst 434-547-7279. The evening will included a home style meal, Gospel Music, and special guest speaker Ex-Inmate Larry Blue. Transformed by the power of God from addictions to serving as Prison Chaplain, Drug Counselor and currently serving as Recovery House Inspector for the State of Indiana’s over 90 Recovery Centers.